Everything Changes – The Guide to Young Adult Cancer » What Quotes or Scriptures Help In Tough Times? What Quotes or Scriptures Help In Tough Times? When I was 27 years old, I sat on a pleather exam table and had a doctor two years older than me tell me I had cancer. Everything in my life changed. But, this is actually not why I called my book Everything Changes. During cancer treatment, many patients rack up hours sitting on their toilets. I kept a big stack of reading material next to mine. I would open to random pages in the Tao de Ching, a Chinese philosophy book written in the 6th century BC. One day in the midst of wishing my life were different, that my body aches would subside, that I would not be single on a Saturday night sitting on the toilet with cancer – I opened to a random page in the Tao de Ching and pointed to the words ‘Everything Changes’. And it is true. I’m now married. I still have cancer but I rarely have body aches. And I spend much less time in the bathroom. The mantra ‘Everything Changes’ gets me through the hardest moments of living with cancer. No matter what any of us are experiencing right now, a basic truth is that everything changes. It is great to know that I won’t stay stuck anywhere forever. I’m not naive. I know change could lead me down hill instead of up. But that’s just reality. I don’t need magical thinking to get me through tough times. I just need a bit of truth that keeps me moving forward. Everything changes. That’s real. That’s something I can count on. And in desperate times, having something to count on is my definition of hope. I loved talking to Tracy, a breast cancer patient in Alabama who I interviewed for my book. 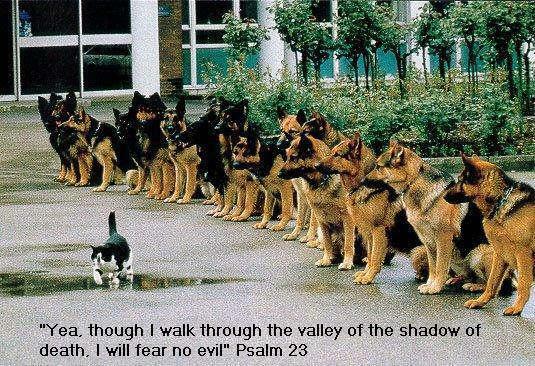 Before each treatment, she sat in the parking lot and read Psalm 23. Do you have a favorite quote, phrase, scripture, or mantra that gets you through hard cancer times? 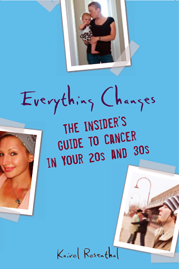 Check out Everything Changes: The Insider’s Guide to Cancer in Your 20s and 30s to learn more about Tracy and how she coped with treatment related fear and depression. John 11:4, Romans 8:28, Isaiah 57:1. There is also a quote I used in my book by Ralph Waldo Emerson that helps me…”What lies behind us and what lies before us are tiny matters compared to what lies within us. This one helps me, and it’s in Latin no less. It makes a good mantra and if you can coach yourself to breathe each time you say it all the better. Nothing too profound really, or at least not to anyone else. But the one and only time I tried to talk to my husband about the possibility of his passing, while undergoing treatment for hodgkins lymphoma, he stopped me before I could even SAY the words “what if you die?”. He put his hand on my face and said “No matter what, we’ll be ok.” and that was the end of the conversation, because I KNEW he was right. I tell myself that every single day- both before his death and in these 8 months after. When I read Charissa’s comment, it reminded me of my second date with my now husband. When I told him that I was living with cancer, I expected the same freaked out reaction that most men gave me. Instead he said, “That’s ok. We’ll deal with it together.” Whether it is cancer or other hard times we are facing, it is so true, he and I deal with it together. “No matter what, we’ll be okay” and “We’ll deal with it together,” might not be phrases ripe for a greeting card or mug, but they are rock solid phrases that provide a hell of a lot of strength. * When you’re going through hell KEEP GOING. * Failure is not an option. Great post – and photo. I’ve always liked Thomas Edison’s quote about how relentless he was inventing the lightbulb, “I have not failed, I’ve merely found 10,000 ways that do not work.” Failure is always an option; it’s going to happen at some point. However, it’s not a true failure if you get back up try again. “When in doubt twirl,” by Ted Shawn, there was something about the idea of dancers not knowing what to do next and them just twirling, that made sense at the time of my cancer treatments . . . not that I could physically twirl, good god no, but the idea. . . This quote helped me get through the year of colorectal cancer treatments (stage 4) and continues to do so in this surveillance phase. i keep it right on my desk at work. I love how applicable it is to so much that can show up real or imagined.